46 | TH E M R EP O RT O R I G I NAT I O N S E R V I C I N G A NA LY T I C S S E C O N DA R Y M A R K E T ORIGINATION THE LATEST Credit Unions Report Over $1T in Assets The financial institutions had a banner fourth quarter, posting impressive growth across the board. C redit unions performed extremely well in the fourth quarter of 2015, with the highest share growth since 2009, strongest loan growth in 10 years, and the highest rate of member growth in 30 years. The National Credit Union Administration (NCUA) reported that federally insured overall credit unions' shares and deposits increased $65.2 billion, or 6.9 percent, from the fourth quarter of 2014. Total assets at credit unions rose to $1.2 trillion at the end of the fourth quarter of 2015, up $82.2 billion, or 7.3 percent, from the end of 2014. In addition, shares increased 14.5 percent for the year, NCUA reported. 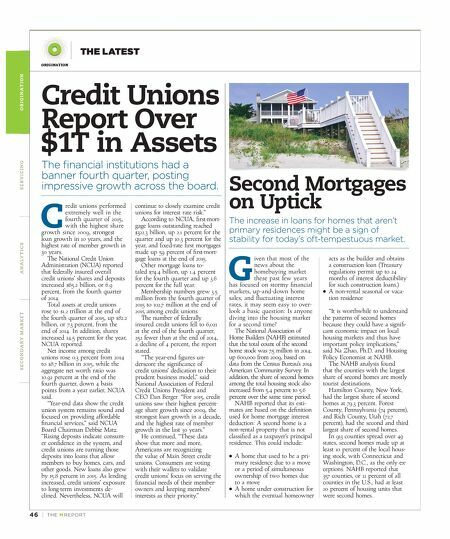 Net income among credit unions rose 0.3 percent from 2014 to $8.7 billion in 2015, while the aggregate net worth ratio was 10.92 percent at the end of the fourth quarter, down 4 basis points from a year earlier, NCUA said. "Year-end data show the credit union system remains sound and focused on providing affordable financial services," said NCUA Board Chairman Debbie Matz. "Rising deposits indicate consum - er confidence in the system, and credit unions are turning those deposits into loans that allow members to buy homes, cars, and other goods. New loans also grew by 15.8 percent in 2015. As lending increased, credit unions' exposure to long-term investments de - clined. 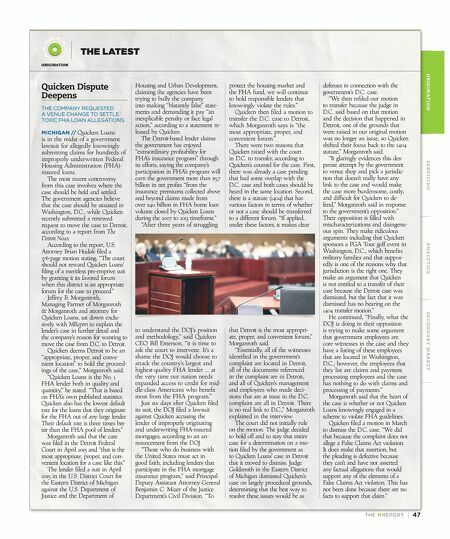 Nevertheless, NCUA will continue to closely examine credit unions for interest rate risk." According to NCUA, first-mort - gage loans outstanding reached $322.3 billion, up 2.1 percent for the quarter and up 10.3 percent for the year, and fixed-rate first mortgages made up 59 percent of first-mort - gage loans at the end of 2015. Other mortgage loans to- taled $74.4 billion, up 1.4 percent for the fourth quarter and up 3.6 percent for the full year. Membership numbers grew 3.5 million from the fourth quarter of 2015 to 102.7 million at the end of 2015 among credit unions. The number of federally insured credit unions fell to 6,021 at the end of the fourth quarter, 252 fewer than at the end of 2014, a decline of 4 percent, the report stated. "The year-end figures un - derscore the significance of credit unions' dedication to their prudent business model," said National Association of Federal Credit Unions President and CEO Dan Berger. "For 2015, credit unions saw their highest percent - age share growth since 2009, the strongest loan growth in a decade, and the highest rate of member growth in the last 30 years." He continued, "These data show that more and more, Americans are recognizing the value of Main Street credit unions. Consumers are voting with their wallets to validate credit unions' focus on serving the financial needs of their member- owners and keeping members' interests as their priority." Second Mortgages on Uptick The increase in loans for homes that aren't primary residences might be a sign of stability for today's oft-tempestuous market. G iven that most of the news about the homebuying market these past few years has focused on stormy financial markets, up-and-down home sales, and fluctuating interest rates, it may seem easy to over - look a basic question: Is anyone diving into the housing market for a second time? The National Association of Home Builders (NAHB) estimated that the total count of the second home stock was 7.5 million in 2014, up 600,000 from 2009, based on data from the Census Bureau's 2014 American Community Survey. In addition, the share of second homes among the total housing stock also increased from 5.4 percent to 5.6 percent over the same time period. NAHB reported that its esti - mates are based on the definition used for home mortgage interest deduction: A second home is a non-rental property that is not classified as a taxpayer's principal residence. This could include: • A home that used to be a pri- mary residence due to a move or a period of simultaneous ownership of two homes due to a move • A home under construction for which the eventual homeowner acts as the builder and obtains a construction loan (Treasury regulations permit up to 24 months of interest deductibility for such construction loans.) • A non-rental seasonal or vaca- tion residence "It is worthwhile to understand the patterns of second homes because they could have a signifi- cant economic impact on local housing markets and thus have important policy implications," said Na Zhao, Ph.D. and Housing Policy Economist at NAHB. The NAHB analysis found that the counties with the largest share of second homes are mostly tourist destinations. Hamilton County, New York, had the largest share of second homes at 79.3 percent. Forest County, Pennsylvania (74 percent), and Rich County, Utah (72.7 percent), had the second and third largest share of second homes. In 913 counties spread over 49 states, second homes made up at least 10 percent of the local hous - ing stock, with Connecticut and Washington, D.C., as the only ex- ceptions. NAHB reported that 357 counties, or 11 percent of all counties in the U.S., had at least 20 percent of housing units that were second homes.